Protected: Is White House Adviser a Former Abortion Advocate ? So we’ve learned over the past few days that a trio of Mitt Romney’s chosen advisers helped the Obama administration craft ObamaCare. And on top of that, that Gov. Romney sought the advice of Malthusian green activist John Holdren, when Romney was considering a cap and trade regime for Massachusetts. Holdren was Appointed by PRESIDENT BARACK OBAMA as his Science Czar and Holdrens’ clear abortion ideology is something we would expect from OBAMA in this as well as the next term. 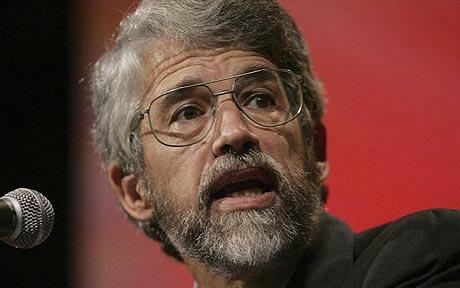 Holdren’s views humanity as a plague on the planet and the Industrial Revolution as a tragic mistake. The fewer people, he believes, the better, and he’s not shy about the ways he would use to reduce their number. Why Gov. 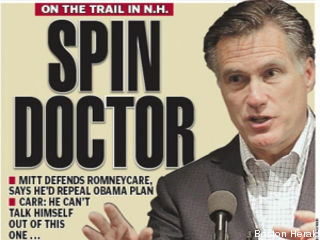 Romney, a reasonable person, would pick such a man to advise him on anything is beyond us. On Jan. 1, 2006, Massachusetts became the first state to regulate CO2 emissions from power plants, something the Obama administration is trying to do to all states through the Environmental Protection Agency’s draconian job-killing regulations and mandates. Paul Ehrlich is also the author of the 1968 book, “The Population Bomb,” which warned of imminent mass starvation from overpopulation unless excess humanity is dispensed with. 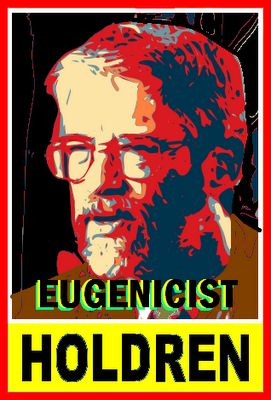 Holdren has spoken in favor of such things as forced abortions, confiscation of babies, mass involuntary sterilization, bureaucratic regulation of family size, and a planetary regime to enforce climate regulation and population control. 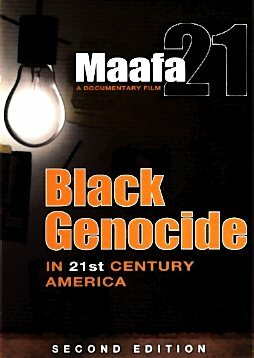 After researching eugenics and reading several chapters of the book, Ecoscience, written in the 70’s, by Paul Holdren, who is Obama’s Science Czar, I can see clear signs that everything that is coming down from Washington was being birthed in our society in the 70’s and before. If you read Holdren’s writings, you will see the philosophy behind CAP and TRADE spelled out . Based on population control writings, they truly believe that unless we involuntarily depopulate the earth- we will see an end to human civilization as we know it. Back in the 70’s people like Holdren and Paul Ehrlich predicted that if the US reached 200 million, it would be devastating. They predicted that when people have reduced economic spending power, they have fewer children. Now that America is over 300 million and considered a society which leaves the largest carbon footprint, they are frantic. They do not have a Creationist/ Godly basis for their beliefs and thus they are not at all concerned about sacrificing a few million humans for the salvation of the planet. OTTAWA — Canada’s privacy commissioner says the world’s most popular search engine knows too much about Canadians. Jennifer Stoddart says Google broke Canadian privacy laws when it accidentally collected personal information from unsecured wireless networks while putting together its Street View mapping service. An investigation by Stoddart’s office found complete emails, addresses, usernames, passwords and even a list that provided the names of people suffering from certain medical conditions was collected. Stoddart says an engineer’s careless error is at fault for the privacy breach. In their response to Stoddart’s findings, the company said it had no intention to use the data and would keep it safe until all investigations are complete. But Stoddart said Google must also beef up privacy training and controls. House Ways and Means Committee Chairman Sander Levin (D-Mich.) is refusing to hold public hearings to examine administration plans to implement a new health care rationing system at the Centers for Medicare and Medicaid (CMS). The president’s new Medicare Rationing Czar, Sir Donald Berwick, is a big fan of British health care rationing. “The decision is not whether or not we will ration care — the decision is whether we will ration with our eyes open,” Berwick said in an interview prior to his recess appointment to head CMS. Will government death panel bureaucrats bar age-related pacemaker surgery for grandma and prescribe a pain pill instead — as President Obama recommends? “Apparently, House Democrats are really taking Speaker Pelosi’s ‘we have to pass the bill so that you can find out what is in it’ style of governing to heart. Now, we have to hand the reins at CMS over to Dr. Berwick first so we can later find out what direction he will take Medicare and Medicaid,” said Rep. Dave Camp (R-Mich.), top Republican on the House Ways and Means Committee, after Levin refused to hold a public hearing. Berwick was given a recess appointment by the President — a process put into place for emergencies that has been abused by this and other presidents. Of course, Obama has taken this particular abuse of the Constitution to new heights. Republicans had not blocked Berwick’s appointment. Senate confirmation hearings had not even been held before Obama made the “emergency” appointment during a week-long Senate recess over the 4th of July. Now Levin, the Democrat chairman of the House committee with CMS oversight responsibilities, is refusing to hold public hearings to question Berwick about his “eyes open” plans to restructure CMS into a health care rationing body. “At a time when Democrats have implemented the most radical changes ever to the nation’s health care system, they are refusing to conduct the proper and necessary oversight required by the Committee,” Camp said. Camp also pointed out that Democrats are so secretive about implementing Obamacare that Health and Human Services (HHS) Secretary Kathleen Sebelius hasn’t been before the committee in over a year. “Despite the one-half trillion dollars in cuts to Medicare, estimates that health care costs will continue to skyrocket and billions of dollars in increased costs to small businesses as a result of their health care bill, the Committee has not held a hearing with the HHS Secretary in more than a year and has yet to bring the CMS Chief Actuary before the Committee this Congress despite repeated requests by Committee Republicans,” Camp said. News reports out of Britain over the past week show Berwick’s paramour has further collapsed under her own weight. The New York Times reported Saturday that Britain is undertaking a massive overhaul to decentralize its disastrous socialized health care system. The new emergency British health care plan — entitled “Liberating the National Health Service” — is downsizing its bureaucracy because socialized medicine costs too much, rations care and limits access. Now I suppose they’ll let you in the room when death panel bureaucrats deny your cancer treatments? The London Telegraph reported Saturday it had uncovered new cuts at Britain’s NHS including kicking terminally ill patients out of the hospital; rationing even common procedures including hip replacements and cataract surgery; telling dying cancer patients to manage their pain on their own if their condition worsens at night or on weekends so that doctors don’t have to come in to treat them; closing nursing homes for the elderly; slashing the number of hospital beds — including those for the mentally ill — and discouraging general practitioners from sending patients to hospitals. Doctors told managers “again and again” that consultants were unable to know that equipment was missing until the last item had been used, when their patient was already lying on the [operating] table, according to the minutes of June 16 meeting. The document states that Chris Streather, the trust’s chief executive said the situation had improved to the extent that the trust could now pay some of its bills, but that he could not promise that the problem would not recur. It describes “significant risks” to patient safety because of shortages of beds, and “chaotic” failures dealing with such crises at the trust, which also runs Queen Mary’s Hospital in Sidcup, in Kent, and Queen Elizabeth Hospital in Woolwich, London, and NHS units in Orpington and Beckenham, in Kent. Patients affected include a woman who had undergone major cancer surgery who could not be found a bed. American Medicare is already rationing health care through denial of certain tests and procedures — and when Medicare denies coverage, they’re not talking about denying payment. Unlike private insurance, when Medicare denies payment, the government blocks the patient from undergoing the procedure. Medicare patients today are barred from paying their own doctors with their own money for any procedure Medicare denies. That’s called rationing. Ask your doctor about it. And while you’re asking questions, call your member of Congress and ask why Democrats won’t allow Sir Donald Berwick to talk about his new scheme for America’s Medicare system in public. Connie Hair writes daily as HUMAN EVENTS’ Congressional correspondent. She is a former speechwriter for Rep. Trent Franks (R-Ariz.) and a former media and coalitions advisor to the Senate Republican Conference. You can follow Connie on Twitter @ConnieHair.